Do public institutions understand cyclists in Northern Ireland? The term cyclist is a very polarizing word. It generates anguish, hatred and despair ideas to some while it invokes freedom, joyful and peaceful feelings to other people. But, in the end, a cyclist is just another person that chooses to cycle their journey. It is no more or less than any other person in any other mode of transport. Nonetheless, due to the vulnerability of the cycled journeys, these people (that chose to cycle) must be better protected than they currently are. Unfortunately, the controversy about the word cyclist does not end here. With it comes a set of (moral) obligations that have no ground on either law or science and that are repeated until exhaustion. About four months ago, PSNI Craigavon published an experience from an off-duty police officer that encountered a person cycling without lights during dark hours. While it is sensible to raise awareness of the needing of lighting (and the reason it is mandatory) the form and content share the lack of understanding of what really provides safety for those who choose to cycle. Emergency stop, and thrust the that the guy behind was still keeping a safe distance and wasn’t looking at his phone or something. This quote normalizes dangerous behaviour for people driving. If someone is inattentive, especially by looking at the phone and driving without proper safety distance then they are accountable for their mistakes, as stated in the Highway Code. Worse than that, is to actually normalize a behaviour that puts more people in danger (no only those that cycle) than people cycling not wearing a helmet or hi-viz clothing. Not even reflectors, let alone lights, wearing dark jacket and jeans. Not even a helmet either. […] A dark sunny day can become gale force winds […] and darkness in no time. That means light front and rear, high viz clothing and a helmet. The only sensible recommendation here is to use lights. The remaining advice on the clothing to wear and the helmet usage is unproven to actually lead to better safety for people cycling. It doesn’t either make the vulnerable users more visible or alter the behaviour of drivers around them. The website Cycling Fallacies debunks the usage of both hi-viz garment or helmet as a safety improvement. Also recently, an history has emerged where a person cycling, with hi-viz clothing and helmet, was put in danger no less than 5 times in a short commute. Earlier this month, another person cycling, fully “compliant” with the requirements laid in the publication above, has been hit and will face a long recovery time after surgery. Shattered patella. Broken toe and a few other bits and bobs. Surgery this afternoon. Hopefully off crutches by my wedding!! Thanks for the messages likes and retweeted. Hope this message gets to the journalists out there…. As with these examples, there are certainly many others and each one of them has the potential to discourage people to start or continue cycling. It also perpetuates ideas that are largely inaccurate and that, in case of a collision, can lead to victim blaming. This publication has been largely shared among police forces in Facebook, which enhanced the broadcast of advice that is mostly inaccurate. However, other police forces in Northern Ireland have taken on board a recent example of a successful run campaign by the Police of West Midlands. Operation Close Pass has been adopted by many police forces in Northern Ireland, including Belfast and Mid Ulster. It is an operation that in West Midlands has seen a reduction of 20% in the number of people killed or seriously injured while cycling, which shows a police activity that actually reduces road danger for vulnerable users. Advising or demanding specific items to wear while cycling is not the only way to misunderstand the needs of people cycling. In terms of infrastructure, it is very easy to compromise the needs of the most vulnerable users. This is quite visible during the planning of newer infrastructures, where there is always a need to place all road users in equal standing even when the governments themselves point to a road user hierarchy. This graphics always look good in documents but are rarely applied in practice. This is a situation that also occurs regularly during road and building works. During the ongoing latest construction for newer Belfast Harbour buildings, the planning permission approved that the entrance to the Queen Elizabeth II bridge would increase to include 3 car lanes and the existing crossing on the west side of the bridge would be changed to a puffin crossing. Without any temporary crossing in place, it forced people to the east side of the bridge, effectively increasing the journey by 350 meters. Without a temporary solution in place, pedestrians were forced to walk extra 350 meters. 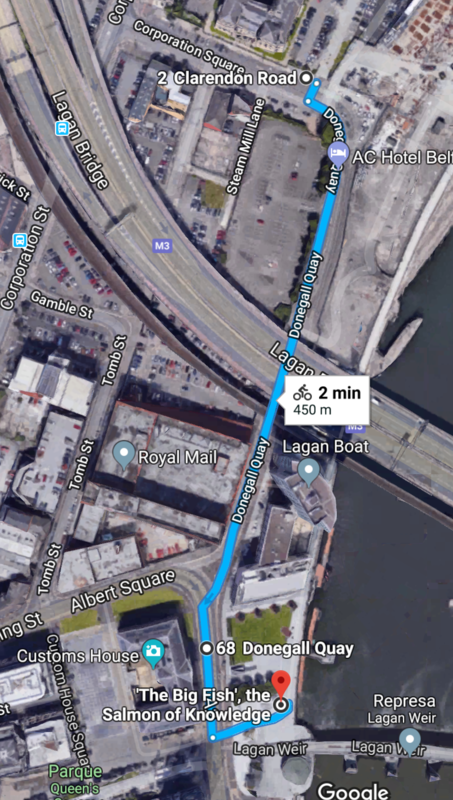 Relative to the same planning, one of the few protected cycle paths in Belfast at Donegall Quay has been obliterated, while the motor vehicle space stayed intact. The diversion provided for people cycling doubled from the existing solution. It is just natural that some people ignore it and use the road, while others prefer the safety even at the cost of directness. It is easy to acknowledge that neither benefits from this situation, while motor vehicles largely remain unaffected. In the meantime, the Dutch create better and safer diversions for people walking and cycling and force the remaining road users to lengthier alternatives. A cyclist is any person who chooses to ride a bicycle. It is a mother, father, brother, sister, daughter or son of someone else. As a road user, a person cycling also has to obey the rules of the road. But, due to its vulnerability and the benefits that bring to society, the cyclist’s safety, convenience, and priority must be understood by everyone, especially by any association or institution that can act on making it happen. Requiring specific items of clothing or making detours for those cycling shows the dysfunction of the institutions that allow this status quo to perpetuate. Stopping these pieces of advice and ways of planning from public institutions is the real first step to recognise cycling as an effective mode of transportation. Compounding it with real and active changes that enable and promote cycling, will result will in cyclists become part of the norm and a healthy appearance on the streets. ← Cycle parking, time for regulation? Objections to Belfas… on Would you Love Living Here?